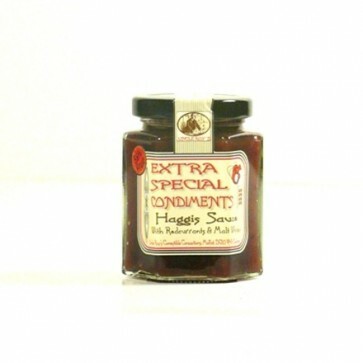 A rich redcurrant sauce with a hint of whisky and horseradish. Great with traditional and vegetarian haggis. Ingredients: Redcurrants (58%), sugar, whisky (3%), horseradish, salt, pectin, locust bean gum, guar gum, rosemary extract. Wheat free, suitable for vegetarians.